Before there can be a new beginning, first there has to be an end. Many goodbyes were said to what was considered home for many, and it all made way for a hopeful future in a new planet with promise. The second half of the finale slowed down the rush that everyone was on, and at the same time proved why much like the heroes of the show, in some regards it was too late to return to some things that were very important in the end. It presented a completely new story, with an official conclusion to Earth as it was. But yet the question still remains, was the endless cycle that everyone is on intentional or are storylines on The 100 unable to find a way to break the cycle? "Damocles – Part Two" written by Jason Rothenberg, was an episode that in many ways was exactly what Season 5 needed. The finale wrapped up everyone's time on Earth without focusing too much on the shocking plot twists that could have formed there, instead, that was saved for a shift that deserved all the attention. 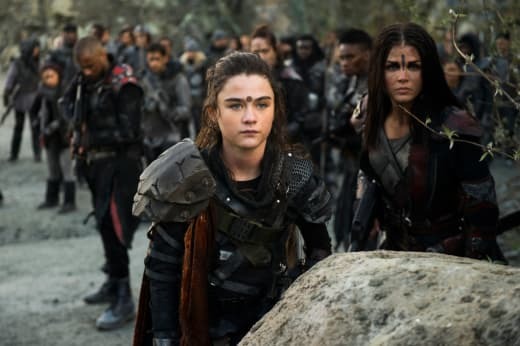 A theory guessed by a few, including in my The 100 Season 5 Episode 13 Preview, set the story in a different course with a new planet and a new challenge for those that will inhabit it. Yet circling back to the idea that the writing for The 100 seems to be stuck in its own endless loop, much of what should have stayed on Earth didn't. Is it a fresh start when the aspects of Earth that didn't work are still tagging along? Or is this a set up for a possible need to examine what exactly shouldn't see the light of day in that planet, for the sake of the characters involved and the planet itself. Earth really was the acceptable loss in all this, and it would be awfully repetitive if this continues on once again in Book Two. 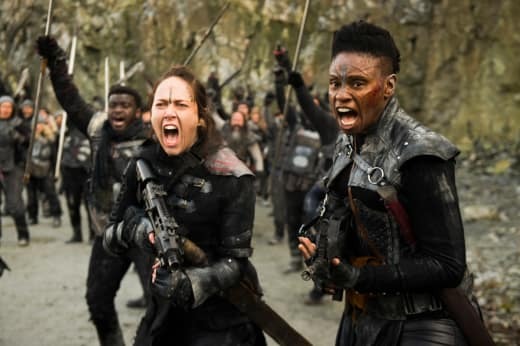 During The 100 Season 5 Episode 13, everyone ends up in space to escape the hell that McCreary unleashes by destroying Shallow Valley. They decide to go into cryo because Earth is meant to be fine in about ten years. But in a last-second plot twist, Bellamy and Clarke wake up 125 years later because of Monty and Harper's son Jordan. He shows them videos where Monty and Harper explain that they stayed out of cryo because they wanted to figure out the next steps for everyone, which ended with them living their lives out on that ship so that a new planet could be found for the others. In a heartbreaking twist, Bellamy and Clarke look down at their new chance at a fresh start together. It is still shocking to accept that Earth truly is no more in this story. Humanity destroyed what sustained them for so long, and it can't be a coincidence how much the Earth became The Giving Tree to everyone that returned back to it. But it gave all of itself to people and it wasn't good enough, mostly because of someone so random and ironically unnecessary. While everyone's eyes were on Charmaine and Octavia, McCreary slipped in there like a real snake and destroyed it all. It is upsetting to consider how much hope there was for change, and much like the show, that doesn't seem to be possible in ways that make sense to the observer. Getting this chance to say goodbye to the place that the heroes (and we currently) call home was what stood out nicely. The entire fifth season was all about rushing, with the first few episodes raising the stakes and showing why that worked well. But then the second half of the season had another rush altogether, it was all about that twist and that unexpected idea that essentially didn't have much weight when this happened in every single episode. A jaw-dropping moment for the season can't be introduced in every episode, it takes away from the expectation that comes with it. There are no high stakes when everything is considered as such, and this became very clear in the back half of this season. So coming to this point where the focus was almost slower in pace and that didn't focus on everything that made Season 5 lose momentum was a nice break. The expectation of a brutal bloodbath was also removed from the narrative, which also helped angle the finale at that last twist and not the fact that many lives were lost. 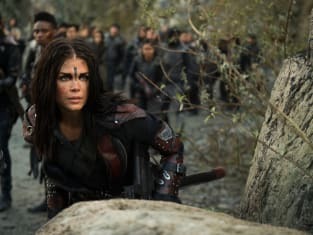 Something like The 100 Season 5 Death Watch may not have been anything, but that is exactly the part of this finale that worked. Which leads to the real issue of the season and the finale as a whole. There is no better way to express the frustration with the build-up that came from tearing at various character connections and then never delivering on the conclusion to any of it. Even with a slowed down finale like this one, the sacrifice had to be any contextual conversations about large portions of the season that clung onto the idea that character development and relationships could be threatened left and right. Clarke Griffin is a perfect example of using a character in a way where her actions just weren't identifiable anymore. When there isn't any way to figure out what the lead is thinking or why she is doing what she is, there is a disconnect far greater than just the excuse of a time jump. Because a time jump could have paved the way for an actual conversation about Clarke becoming completely focused on Madi in a way where she almost went mad in the process. There was room for that and it could have made so many future choices that much more digestible, but instead, it was left mostly unspoken for. There are hints but especially during a season as difficult as this one was, there just isn't any more room for vague context. it has to be said and furthermore, it has to be explored. There was plenty of room to air out six years of pain, grief, worry, loss, and mourning. There was plenty of room to take a second and reflect or to veer off the big plotline course to give characters those moments that they needed between one another. There was plenty of room to not craft a season built on endless doom and gloom, with not much room for anything else in between. How about during the three worm related episodes that in the end amounted to nothing? Or maybe during the episodes that constantly focused on Clarke not giving Madi room to breathe as if that wasn't going to be reversed. Or during the episodes that built up this villainous path for Octavia and then took her off it the second the finale drew too close and she was still an obstacle. Looking back, there were too many arcs that didn't need to be there when the pay off was just a quick fix and a shift forward. But the same can't be said for resurfacing plots that are proving to be the real weight for the show and the characters that end up involved in it. Much of that is the idea of the flame and Commanders somehow holding any value on a new planet with possibly new people but also just nothing from Earth? The Grounder settled into this way of thinking but if there is any hope for a new fresh take on anything, bringing over every possible conflict from Earth is just setting up for nothing. How does this become a new story where the characters have to adjust to an environment they know nothing about when following them are the same structures that took down Earth? Putting consistent allegiance to someone with black blood and then unleashing war in the name of it is one of the big mistakes that made Earth what it is. The Sky People made their mistakes but it isn't like the Grounders didn't. Their way of life is what caused Madi to be hidden by her parents, so much of this became kids fighting each other and leaders dying too early in their lives. And in a way Monty making sure Bellamy and Clarke wake first signals that awareness that those two are the ones who have to hold this on their shoulders. They are the ones that face every new destruction together, leadership status or not. But there is no way around the fact that much of what fell flat this season because it couldn't deliver is now what is being brought over to the new planet that is promising anything but dwelling in the destructive. There is almost this attempt to straddle both the idea of acknowledging everything that Season 5 should have, while also following the path of a new start. The question could of course be, what kind of a fresh start could there be when all of this baggage traveled with us? But this sets up a truly terrifying cycle of a third season that reverts back to the comfortable and familiar arcs that still have "room for exploration" and from there dooming the rest of the stories that will surface. There has to be a balance, with an understanding that a lot of the work that Season 6 will have to do to repair what it broke has to be done without those issues still hanging out so close to the surface. Saying goodbye to Earth may be horrible but in doing so, there has to be a goodbye said for all the mistakes that were made there that shouldn't be made again. Monty putting that warning into their message to Bellamy and Clarke highlights that. They are the ones in charge of not reverting back but looking forward and making something of their mistakes. This isn't only about them but about Jordan and the people that have yet to wake up. They need to break the cycle if there is any hope for a really promising season. I love Jordan Jasper Green with all of my life. Forget everything that you may have thought of him because he is so much more than that. Jordan is a treasure because he is the manifestation of all the good and the pure that came back to space. Monty and Harper's love for their people and each other built the hope for the future. Their son is a direct reflection of that, he has already demonstrated just how much of who his parents were to the show and to the audience won't get left behind. Monty and Harper are a loss that even with Jordan is hard to grasp, which sounds like the perfect opening for a feature on their legacy. But for now, they found their happiness in living out their days in peace and in knowing that they are leaving their other family with a real chance at survival. It is all kinds of upsetting, watching them live out their lives in those videos tore at my heart like nothing else could. Monty's interest in this new planet and what it could hold is the really painful part because at the root of it all he wanted to be there with everyone experiencing it. Monty and Harper had their happy ending but everything is better with their entire family. They are a perfect example of not every story having to be epic in outrageous ways, something it is about just living and prospering in ways that make you stay yourself. Monty and Harper clung to their humanity and at the end of the day, no one deserved to have it like they did. This was a happy ending that not many are promised but that Monty and Harper were always heading towards. They held onto the parts that made them innocent until the very end. It was an honor to get to spend as much time with them as we did, and there are not enough words to explain just how much value they had. But Jordan in a way is this chance not to let go of that completely, with him representing Monty, Harper, and Jasper. They all wanted to believe that there was a way to survive without losing yourself, and having such a presence in the form of Jordan is perfect. As it was mentioned before, he is the key to a new beginning. But he is also just a pure human that is lovely and fascinating. He has this background built in, the way that he hasn't interacted with anyone outside of his parents. He has so much to look forward to and to face with all of these people suddenly appearing when his whole world was Monty and Harper. There is the way that he was told stories of all of these people, very similar to Madi during the time jump. It will be fascinating to see how Jordan sees the others based on what he knows and how he responded to the stories told by his parents. He has to have a biased opinion of some and not so much with others, specifically the way that Bellamy and Clarke are framed in his mind. But there is still that innocence about him because he was born out of love and out of peace. Madi met Clarke at a point where she had already built up some knowledge about strangers and protecting herself. Meanwhile, Jordan introduces this other extreme of pure hope in a real future and in the people that he will finally get to meet. It is truly the way for the audience to also get that new perspective, following along as Jordan enters this new planet. All in all, Jordan entering the planet is The 100 Season 1 parallel that probably won't stretch for the characters we already knew and loved. Jordan must be protected at all costs because he already proved how deserving he is of only support and appreciation. It is confusing to feel like Bellamy and Clarke are both acknowledged in the finale and yet fall victim to the curse of the fifth season. That ending shot, for me at least, was an ultimate favorite because it is the essence of the show. The meaning that keeps me here is that shot, Bellamy and Clarke being each other's other half as they face the next big painful obstacle in their way. The fact that Monty chose them to be the ones to wake first rings true to what The 100 represents every single season. These two are the story in a way that will never change, their connection is what holds this show together. And yet comes that word again, change. It feels like this has been said too many times and yet the idea of there not being any necessary change rings true with a finale like this one. Bellamy and Clarke may not change and they may be fine with that, but as the audience, there is that awareness that they need to. The way that they count on one another, the lengths they go for each other, and especially the places they have carved out for the other still holds true the idea that they can't ignore how much more of a meaning that holds. This season for all its faults didn't mind dangling that fact over the audience, and in a way over Bellamy and Clarke. It truly was like a rollercoaster, one where one of them was pushed to that high point where they themselves were about to acknowledge something and yet it just got derailed. The fact is that Clarke spent six years calling Bellamy and having him be her strength. She survived because the memory of Bellamy and the knowledge that he was coming back kept her sane in ways that not even Bellamy knew until this episode. The fact is that Bellamy wasn't willing to consider seeing his Octavia as the clear-cut threat in the situation that needed to be faced until Clarke, the traitor that he loved, was taken to be executed. The fact is that Clarke and Bellamy have their investment in the other constantly compared to the way they feel about significant others. The fact is that these two can't be sacrificed to a random plot twist, because their relationship has too much of a past and a touch on every plot on the show that it then becomes a gaping hole if not addressed. So it isn't clear if Bellamy and Clarke never got their well-needed conversation, a full-fledged conversation, because of the fear that comes with what would happen if they spent too much time together when all of these hints and feelings are thrust on screen. Or if this is just yet another mistake that came from utilizing a time jump that was only a stepping stone to the real twist of a new planet. Either way, where do they go from here? Jason Rothenberg has made clear in interviews that Season 6 of The 100 will not be a restart for the many issues that came from this season. Looking at it from the perspective of Bellamy and Clarke's story means having that hope that big impactful moments like the radio calls and the betrayal won't just be swept under the rug so that the focus could be on the new. But yet, what is Season 6 doing by looking back at Season 5? Having all these old issues resurface almost a year from now for us loses the value that it had right this very second. Feeling that pain at Clarke leaving Bellamy to die or that excitement at Madi finally spilling the beans to Bellamy about how much he doesn't understand when it comes to Clarke making it through all those years are all present-day emotions. Having that energy right now is exactly when it needs to be addressed. The audience isn't going to be put in cryo until the next season, time will pass and the investment in a conclusion will fade when entering the next season. 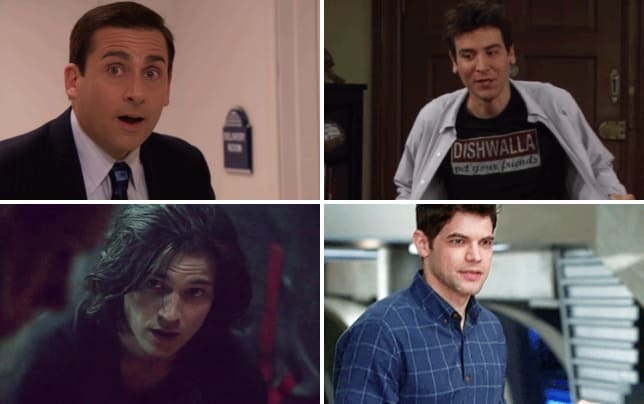 Season 6 taking on everything that Season 5 dropped in its wake is an ambitious goal that could be successful, but it has to be approached with the huge understanding that characters and the relationships they share aren't holding the show back. The quicker this is fully grasped, the more likely they might actually execute a season that allows for the characters to truly feel and talk. Which takes us back to Bellamy and Clarke in the finale and why the scenes they shared still held promise to me. It is easier to accept that Bellamy and Clarke were dropped in the worse way when you compare it to almost any other bond that the show didn't give enough attention to. And yet, there was room for Bellamy to at least start to think about what the audience has had more time to grasp. He is coming to terms with the fact that The 100 Season 5 Episode 5 was a shift for Clarke that he couldn't have even grasped back then. He asked her how she survived not knowing he was crushing the exact hope she held onto for six years, that all the ways that she held onto her life through him actually happened. Instead, Clarke is solidified in the idea that Bellamy moved on, also not knowing how much of that stemmed from her memory holding him up as well. Bellamy asking Clarke to join them in the planning for the future was him having all their previous interactions flash before his eyes. Everything he didn't understand about this Clarke fit into place with the understanding that she was waiting for him like he could never have thought. It was almost easier for him to explain Clarke's survival away through Madi's existence, and he is now learning how wrong he was. All those times that he mentioned family or had meetings with his friends where Clarke just wasn't a priority to include, that was all pulling at a wound that never healed in Clarke. 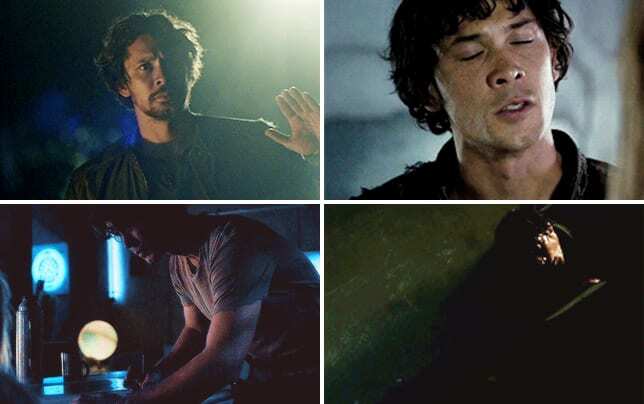 This is only the beginning for these two, and yet it is important for Bellamy to figure out this new version of Clarke and the fact that he was part of her in a way that he couldn't imagine. It reflected back in the way that he wouldn't leave with Monty and Murphy, because the weight of what he had to do and the end result there lingers in his brain. He knows the feeling of leaving someone he loves behind in a way that Clarke never registered that he could. So her finally not pushing her decision to rush was her having her own realization. It was easier for Clarke to think Bellamy moved on from the choice she told him to make when he left without her. But in that field the loss and the pain that he went through never felt so real. Bellamy will never get over the fact that he left Clarke, and Clarke never got over the fact that Bellamy was still out there somewhere. But the other had no clue the positions that they put their best friend in. which is where all the tension and the resolve came up. As always, this is all under the surface and while the finale set some of it free, it isn't enough. There needs to be more and it needs to take priority in a way that this season didn't allow any emotions between two characters to be. Because Monty and Harper left their legacy to Bellamy and Clarke. They put all of their lives and their hope for a brighter future in the hands of this duo that they almost knew had to hold that promise because of who they are to one another. They are each other's hope and it is through them channeling that they could make a new planet work. That happy ending at the end of the journey comes from Bellamy and Clarke working together, and it all will always come down to them. The 100 finale touched on that quite clearly with the way that it set up Bellamy and Clarke once again as the survivors looking forward with the other. No matter what someone's feelings may be about the rest of the season, that shot of Bellamy and Clarke alone together is what the show represents. They are the story in a way that the show goes back to over and over again. There is no other adventure if Bellamy and Clarke in relation to each other aren't the parting scenes for the season. In a way, they are each other's home. Them holding each other up and finding strength in one another is what they have always been about. 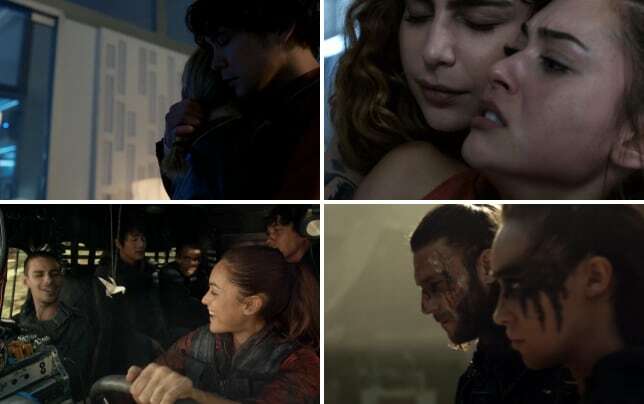 Their relationship is different because there is never a question of how much The 100 needs them to survive. 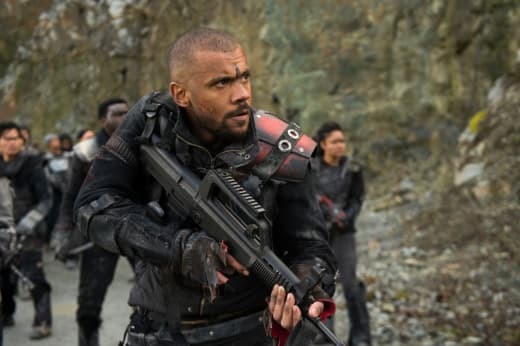 Bellamy and Clarke are the show, but the show actually needs to remember that going forward. It can't forget it or stray from it because that is when everything else seems to crumble. Madi is the Bellarke hero we all were hoping for. She comes through even when they can't come through for themselves. Is there something to read into with the way that Kane's life is the only one hanging in the balance? No other character was left in the hiatus limbo which either means nothing or there is a chance that Kane is in worse shape than expected. This is what happens when you cannibals around, eventually they take too big of a chunk. Raven and not Zeke found happiness as pilots in space. This is a long way from Raven thinking she was going to die on that ship and then code flirting with some random new dude. They are now willing to risk anything for one another and in a bit of a sad comparison, they are now the couple that shows us what true love is. Monty and Harper could never be replaced, but the hope for another possible happy ending for a couple lies with these two. They found one another in a world where they had time against them, and yet they are the pure sunshine that we need now. There may be a planet with two suns, but Raven and not Zeke are the ones really shining. That line shared between Bellamy and Octavia was one of the few things that demanded that follow through. Bellamy still not being able to just forgive Octavia as she hopes he will has been a long time coming. Bellamy has every right to be in this place where he doesn't recognize or connect to this person that was his sister once upon a time. And while Octavia gave up power, this doesn't mean everything gets wiped away. Others can easily forgive Octavia, but it can be argued that that comes from people who aren't as important as her brother is. If Octavia is going to wake up still reeling from Blodreina and searching for an answer for her future, the Bellamy scale is the best way to determine progress. Give me all the Bellamy Blake speeches. Also, give me all of Bellamy Blake looking out for Madi like he promised he would. So like, what is up with this new planet? What's its deal? Shannon Kook is a gift to the show and the future of it. But the casting issue for Monty's soon is still there and it is still glaring at us. Charmaine needs all our love and sympathy right now. This woman has been pregnant for 100+ years and she deserves a medal. At this rate, she just needs to give birth just so that she won't be in this uncomfortable position any longer. She may be a freaking amazing leader, but she is struggling. This child is going to come out as a fully functioning human at this rate. Or maybe all of this just boils down to The 100 now knowing how to handle a pregnancy? Rightfully so as this show serves best without infants and constant pregnancies at every corner. This isn't that kind of show. RIP McCreary. I hated you and will continue to do so. Characters as people and not as pawns in an overarching plot is important for every show. Characters and their relationships with one another are just as important as any epic episodic twist. Maybe the character focus will be our new always. What did you think of the finale? Did it cover everything you were hoping for? Do you think it fits the Season 5 theme well? Were you expecting the twist at the end? What thoughts do you have on this new planet? What do you think of all these old arcs following everyone to their new home? Who do you think will be woken up next? How much did you sob with Monty and Harper's story? How much do you all love all that Jordan is? What did you think of that scene between Madi and Bellamy? Were you expecting these few deaths? Did you think that was a good idea or bad? How much did you love that parting shot? What are your hopes for Season 6 and what are your parting thoughts for Season 5? How soft was it when Bellamy woke up to the sight of Clarke? That hi said it all, didn't it? 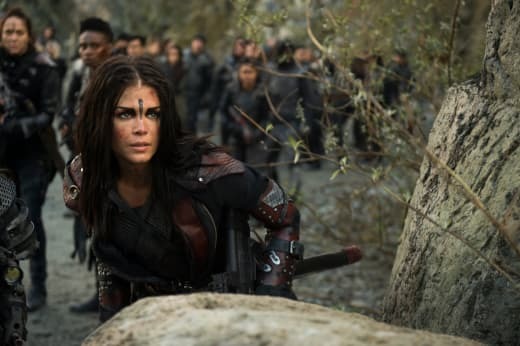 And don't forget that you can watch The 100 online, right here on TV Fanatic!